Sleep is very, very important to being healthy!! I (unfortunately) am a person that needs 8-10 hours of sleep a day to be able to function well in the world. Thankfully, I don't need it all in one session. I take naps and thrive on them! Over the years, and in all the many places my family and I have lived (7 moves in 10 years! ), we've needed room darkening shades to help us sleep. One apartment we lived in had a security light right outside our master bedroom window! Kristen over at TheFrugalGirl.com posted a question about room-darkening shades. I posted a comment with my suggestions how to achieve the darkest room, which prompted a follow-up question. Then, it dawned on me: I could write a blog post about what I've found to be the most cost effective and most decorative way to get the darkest rooms on my own website!!! 1. For ultimate light blocking, buy a wrap-around rod like this one at Target. Otherwise, buy a decorative rod that allows you to use drapery clips. 2. Buy drapery clips such as these. 3. Buy a curtain that makes you smile! 4. Go to JoAnn's or Hobby Lobby and use your coupon to buy enough blackout fabric to cover all your windows (don't have them make more than one cut of fabric because your coupon only covers one cut). 5. Go home and cut your blackout fabric to be just a touch smaller than your curtain; bonus: blackout fabric doesn't fray so you don't have to do anything but cut! **Read below why I don't recommend you sew blackout fabric. 6. Hang your curtain rod fairly high above your window (this is to help reduce light coming in the top of the rod and makes your ceilings look taller). 7. Hang your curtain rod several inches to the side of the your windows to help block light and to allow the curtain to not block any of the window during the day so that maximum light can come in! 8. 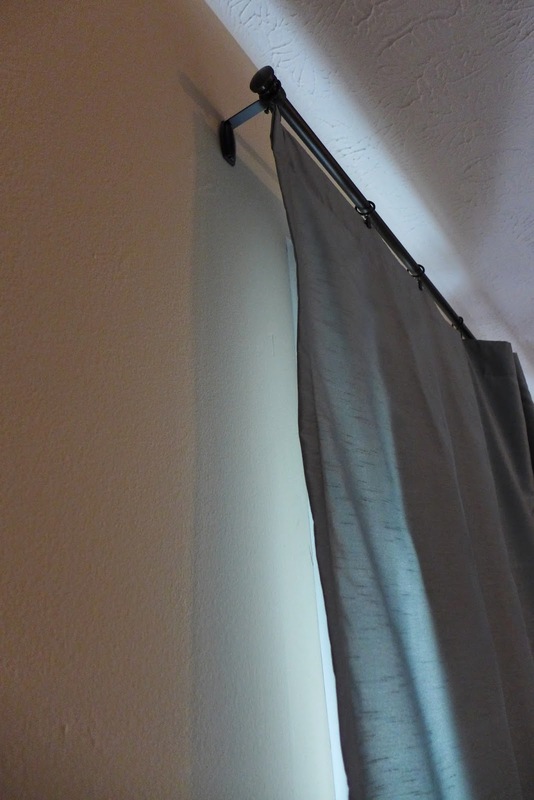 Clip your blackout fabric behind your curtains! 9. Take a nap in the middle of the day to test out your new curtains! 1. I found that pre-made blackout liners are never, ever the right sizes for my needs. Also, they are more expensive than stopping at the fabric store and using a coupon to cut my own. 2. Drapes marketed as room darkening have only actually been dark enough for me when the drapes are dark in color. I have a navy set in my bedroom that are very dark and block out all the light. I have bought "girly" colors for my daughter's room and have had to return them because they let in a TON of light! 3. If your rod keeps moving and not staying together when you open and close your curtains, wrap a rubber band around the rod on the outside of each mounting bracket to keep the rod from moving. 4. I prefer to simply clip the blackout fabric behind the curtain so that when I want to change curtains I don't have to un-stitch the blackout fabric from the old curtain and re-stitch it to the new curtain. Also, sewing blackout fabric creates a small hole in the fabric which allows in light and makes it difficult to re-use. Could you also send me a post on which is the best black out fabric and how you simply "clip" it to the back of your drapes ? Do you have to hem or put in a seam because I do not have a sewing machine. Also, which drapery hooks are the best & most stylish ? Thanks! I'm glad it was a helpful post! In my experience, there isn't a quality difference between black out fabric you buy at the fabric store. Ask the staff to help find the fabric, and they'll be able to guide you on widths, etc. Absolutely no sewing is needed with blackout fabric so no need for a machine :) Also, since the fabric is hidden behind your pretty curtains, you need not worry about how it looks. Process to "clip:" 1. Hang your rod with feeding the clips onto the rod before you mount it to the wall. 2. Grab your curtains and your blackout fabric. 3. Layer them on top of each other with the curtain towards the room and the blackout fabric towards the window. 4. Clip both fabrics together with the clip. 4. Repeat for each clip. 5. Adjust the spacing as needed. Once you try it, it will begin to make more sense! Good luck darkening your room! I am looking for blackout curtains too. What do you mean by "clip"? I don't get near sewing and the only clips I know are those black ones for papers.